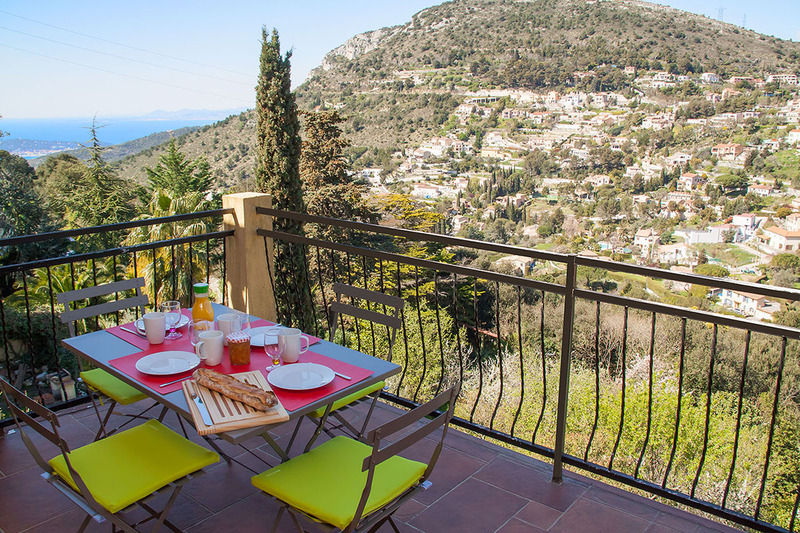 Superb comfortable apartment, for 4 to 6 people, in the historic village of la Turbie, between Nice et Menton, on the French Cote d'Azur. Relax and unwind in this exceptional climate, at any time of the year. Close to Nice, Monaco, Menton. Quality controlled accommodation : 4-star national rating. See our Guest Book - reviews and recommendations. An ideal spot for your meals or just relaxing. 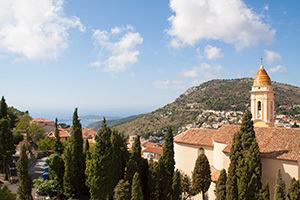 La Turbie - a charming village, typical of the Cote d'Azur, perched on the hillside above Monaco and St Jean Cap Ferrat. Stroll around the cobbled alleys of the medieval quarter, soak up the atmosphere on a café terrace, or be tempted by the excellent choice of restaurants. Try the local specialities from the traditional weekly market. Discover the magnificent coast and the beaches - many to choose from at just a short drive - or try the village swimming pool at just 5 minutes on foot. The surrounding area abounds with places to visit (historic villages, sumptuous gardens, monuments and museums...) and there are beautiful walks along the Mediterranean coast and in the surrounding hills. See the article in France Today magazine on the secret spots to discover near this apartment. Ideally situated for exploring further afield into the Var (St Paul de Vence, Grasse...), into the alpine valleys (Saorge, Breil-sur Roya...) or into Italy (Sanremo, Gênes...). An apartment measuring 56m². Top floor of a 2 storey stone village house. Shops bars and restaurants at 350m. Beaches from 8km (5 miles). Two bedrooms - double bedroom, twin bedroom. Convertible settee in the lounge for sleeping two more, maximum six people. Cot available. Spacious lounge/dining room with view over the valley. Large balcony with view over the valley and to the sea. Dining furniture for 6, deck-chairs, plancha-griddle. TV, DVD player, WiFi internet, washing machine, dishwasher, microwave, cot and high chair. Central heating. Parking nearby. Click a photo to see the gallery. Bakeries, shopping and restaurants, all on foot, weekly market. Relaxing days on Cabbé beach with its charming bar-restaurant. 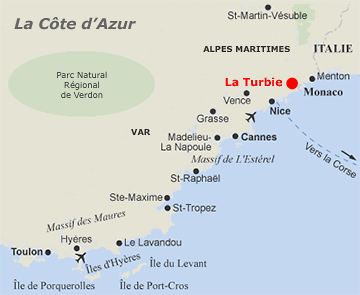 La Turbie - a coastal community on the hillside above Monaco and Cap d'Ail, half-way between Nice and Menton in the Alpes Maritimes 'department'. 25 minutes from Nice - Cote d'Azur airport. 5 minutes from the A10/E80 motorway. Shops amenities and restaurants : 350m. Nearby beaches : Mala 8km (15 minutes), Larvotto 10km (20 minutes), Cabbé 11km (20 minutes), Eze 12km (20 minutes). Need some sun? Low season at only €650 per week! Low season : From € 650 for 7 nights. Mid-season : From € 750 for 7 nights. 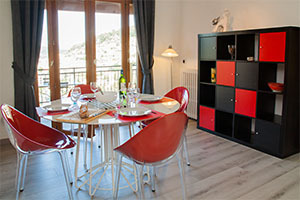 High season : € 850 for 7 nights. Events (Monaco Grand Prix, Nice Carnaval, Menton Lemon Festival) : 5 night breaks possible. All-inclusive prices, bed linen, towels, heating, and residence tax included. Rentals in July / August are by full weeks, Saturday to Saturday. Outside July / August we can propose other durations and start days. Consult the availability of the apartment (accurate in real time) and the prices. Send your request using the contact form or telephone us. Don't hesitate to ask any questions that you may have about the accommodation or the area. We can hold an option open for you for 3 days, free of charge. To confirm your reservation, we require 25% of the rental price, by card or by bank transfer.